What a gorgeous weekend it is turning out to be, here in sunny Wales. The hour has gone forward this morning........ the day is stretching out ahead with the promise of a walk on the beach later........ the sun is streaming through the windows......woweeee! As for my year of projects, I am at a bit of a lull at the moment, as I have a few 'off topic' projects, so I am paddling around in blanket world! One of my cousins has had her first baby, a little boy and I figured I would make a blanket for him.....you know me, any excuse to make a blanket. I've seen these 'waffle' style blankets around and thought they looked lovely, but for some reason, probably choice (or lack of choice) of colours, it just looks all wrong. 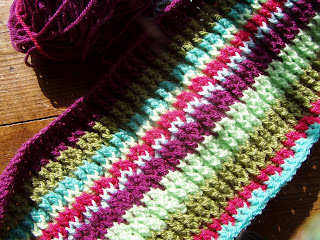 My stylecraft stash needs renewing, as I have little more than 'girly' colours left. The 'wrong' side of this pattern, looks a lot better, but still, I know its not right for the job. I started to also think, that being her first baby, she would probably prefer something more pastel (trust me to hit the colours!) Anyway, I searched for something that took my fancy and found a pattern on a french blog and thought I would give it a whirl by following the simple chart. Its not very 'me' but I have a feeling it may be better received. The baby yarn was in my stash and a colour I would be unlikely to use otherwise, so I reckon I have given it a worthwhile home. This yarn is sublime....the colour and texture....I am truly gutted I don't have enough to make a jumper from it and try as I have, there seems to be no more available......I am not in mind for scarves etc.....but maybe when the end of the year comes around again, I will be more inclined to have a re-think.....if I haven't made loads of owls and pussycats out of it! Anyway, I really should be doing something 'houseworky'....uuuggghhhh, I know, but if I don't, I can hardly be swanning about on the beach this afternoon now can I? 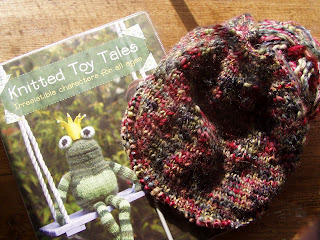 To catch up with other year of project work, see the ravelry page here. I will hopefully have time to catch up on all your lovely blogs, later this evening when little boys are in the land of nod! Thanks for your weekly encouragements, you really are a lovely lot! I sooooooo love your first choice, it's unique, it's truly a gift from you, and it's not like anything else she'll get from someone else. I never make something pastel for babies gifts for just that reason. I'm encouraging you to finish the first one, it will be remembered because it's different. It's bright, and cheery. Studies have been done that prove babies react positively to bright colors much more then pastels. In fact, they don't even see pastels til later. And by making it less babish, they'll be able to use the blanket far longer, particularly if you make it a big larger. Like you I like the wrong side better, funny. A very interesting pattern. Certainly nothing wrong with the 2nd one, it's just sooo ordinary. Let the gift from you have a bit of you in it. If you think Mommy would like the pastel better and if you have the yarn anyway then I think it's very thoughtful of you to do it that way. I don't think the yarn is being used to best advantage in your first blanket, and it is a little girl-y in my view. Yes, better get your chores done so you can get outside. An afternoon at the beach sounds like a perfect way to spend Sunday! I'm sure which ever blanket you decide to give her will be well received since it was made with love. I do however agree with you and like the first one better. but you know your cousin and what she will like. Hope you have a great day at the beach. 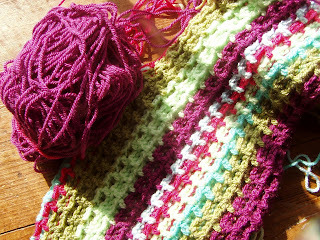 I love the second choice of yarns for a baby blanket, although I do like the bright colours of the first I just love those pastel colours for little ones.... lovely having new babies to crochet for. I think swanning around the beach for the afternoon is a perfectly excellent idea and it could be raining next week and then you'd be inside all day to do houseworky things ... yuck !! Well thats my excuse and I'm sticking to it. Great blankets - either one, but I do prefer the bright colors too! 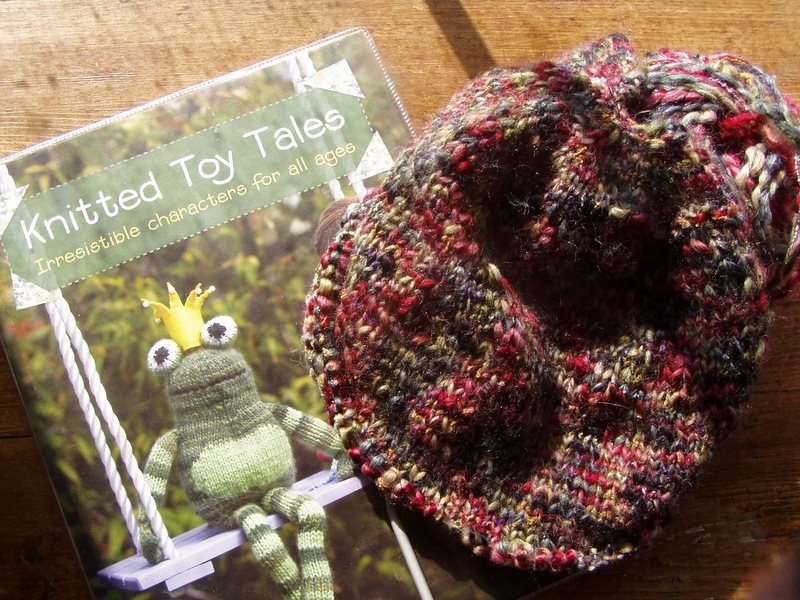 :) Alice over at Crochet With Raymond had that same pattern book with the frog on the cover. Can't remember what she made from it, but it was very cute. I do remember that much. :) Have a lovely walk on the beach. Housework? 'It'll wait for you! ', as my grandmother used to say! I love both but I understand what you are saying about the pastels. Yes, what is that yarn? It's beautiful. (So are the two blankies.) Lucky you to have a beach to walk on! That's the only thing I miss from California (well, that and the mountains). Hope you got your houseworky stuff done so as to cavort with a clear conscience. The first blankie is lovely, but in my opinion, a bit on the girly side. The pastel one is lovely too, and most people are thrilled to receive hand crafted gifts, so I doubt she will look at pastel one and be disappointed. I agree with others--houseworky things can wait and I hope you made it to the beach. I snapped a photo here of tree blossoms with our lovely blue sky in the background. But alas, as the afternoon wore on, the clouds appeared and rain is back in the forecast for tomorrow. I totally know what you mean about not everyone loving 'bright and colourful'.... but for me that would have been perfect! 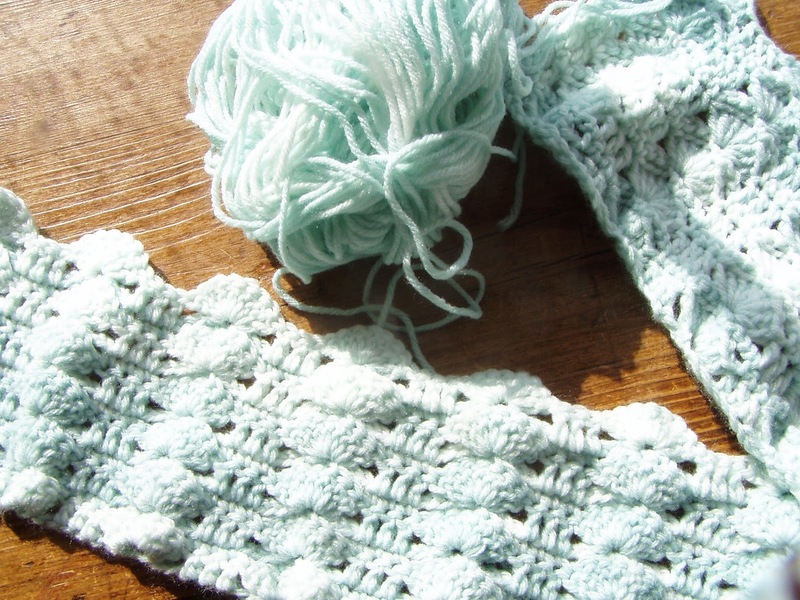 The blanket will look just as snuggly in the neutral shade and the waffle effect is lovely! Great pattern. Can't wait to see your knitted cat...loving the wool you've chosen! The color schemes you are working up are both just lovely! The top colors were so vivid and happyfying. Love it!